It seems to be a problem of mine that whenever I am preparing to leave a place, I find a great local spot. A week before leaving my childhood hometown for the unfamiliar streets of North Dublin, I visited Fish Shop in Blackrock. 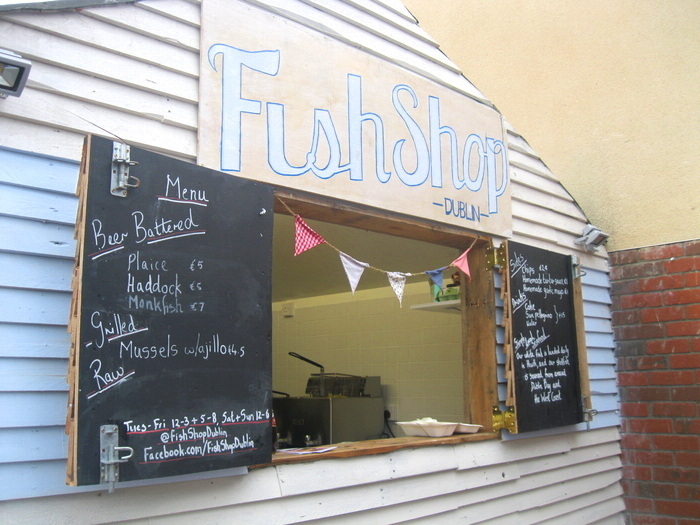 Peter and Jumoke brought their talents from the London street food scene back to Dublin, setting up a lovely kitchen at the back of Blackrock Market selling home made fresh fish and chips from an upcycled outbuilding. The fish is locally sourced and delivered each morning, so the menu changes from day to day. There’s a focus on the environment, recycled wood was used to make the fish shop and its outdoor seating area, and all of the take away packaging is compostable. When we visited, mussels with ajillo and battered haddock jumped out from the menu. We added some home-made chips with tartare sauce for good measure. Peter and Jumoke chatted away to us as they made the food in front of us, even whisking up a batch of beer batter for the fish then and there. There are benches made from recycled pallets at Fish Shop, but we decided to bring our food down to the small seafront to enjoy the view. 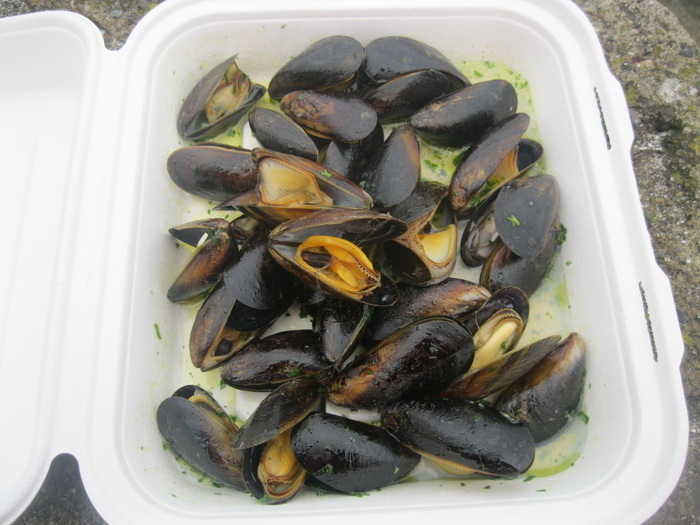 The mussels were fresh and juicy, with the garlic and wine adding enough flavour to complement without overwhelming. The haddock and chips were light and crispy, with a fresh clean taste. The tartare sauce had that lovely yellow colour and thick consistency that you only get when its properly homemade. 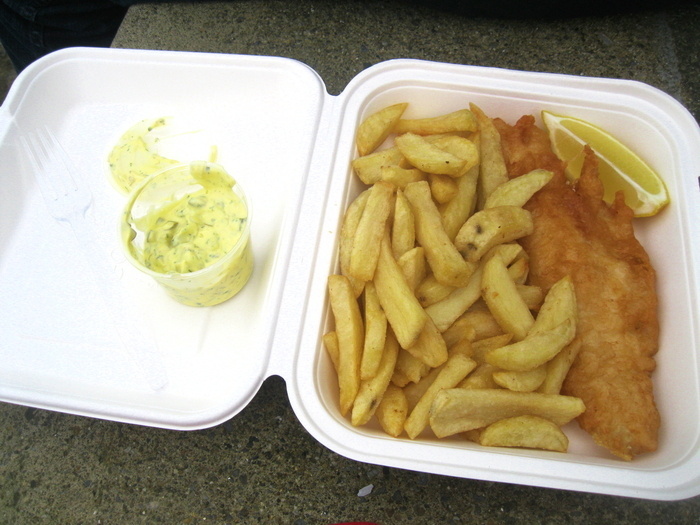 Best of all, the fish and chips didn’t leave you with that greasy, heavy feeling that a lot of fish and chips can. Since we visited, they’ve opened up a pop-up kitchen in the Grape Escape Wine bar in the market, serving dinner from 7-10 Thursday to Saturday. I’ll definitely be finding my way back to South Dublin to give it a try. This entry was tagged Dublin, Fish and Chips, food, Ireland, travel. Bookmark the permalink. There is nothing better than fresh seafood cooked properly…your lunch sounds very tasty. It was great. Dublin is getting good for seafood now, Irish people traditionally aren’t that into fish, despite being an island! Awww, I love mussels and adore fish and chips 😀 I’m v. jealous. I know. They were absolutely fantastic, can’t wait to go back.